The report on the presentations of teams 3 and 4 can be found here. For the last few days now, our four teams have been hard at work coming up with ideas, concepts and solutions for each of their cases. 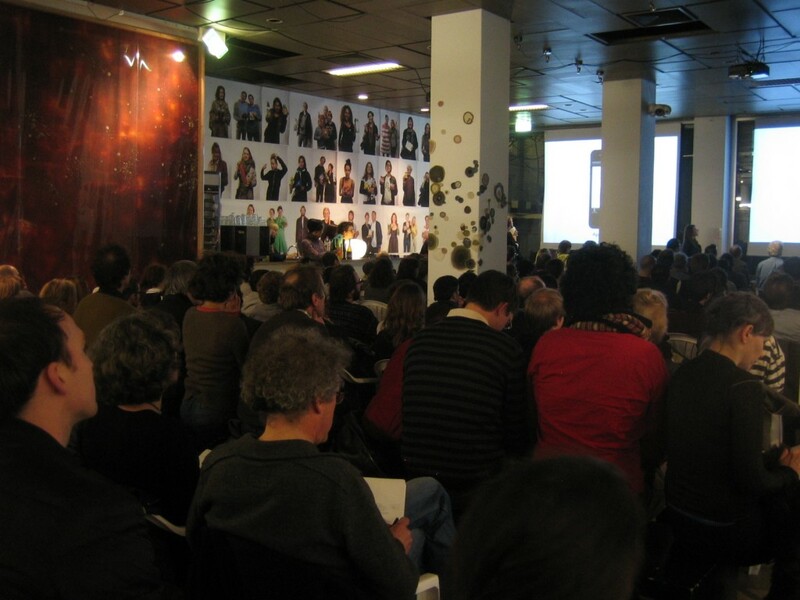 Tonight Mediamatic hosted the final event of the workshop program. 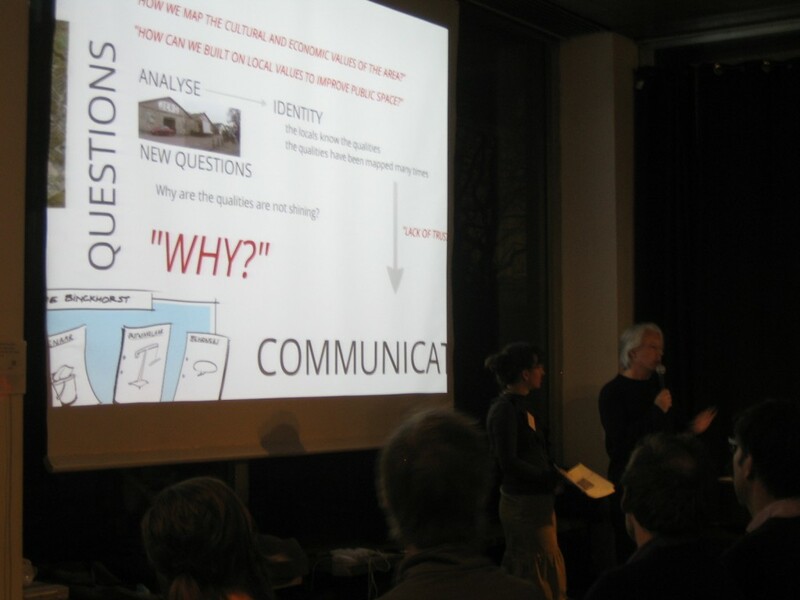 In front of a public audience, the teams presented their cases and their proposed solutions. Of course, the stakeholder organizations were also present and asked to give immediate feedback. Team 1 of the Zeeburgereiland case was up first. For many people in the audience this was the first introduction to the cases, so the team started off with some background information. With that out of the way, team 1 presented their idea: TEMPlot. During the last day and a half, the team had further refined their idea to use the Zeeburgereiland area as a public garden space. Though honestly that is not an entirely accurate description. The plots of land would be available for rent and people would be able to use them in any way they see fit (within reason, of course). Schools could use the area for outdoor activities, friends and families could have barbeques and perhaps it could even turn into a temporary camping site during the summer months. Since the last workshop update, the team has worked to further flesh out the app that would support and facilitate the community of urban pioneers that will hopefully migrate towards the area. 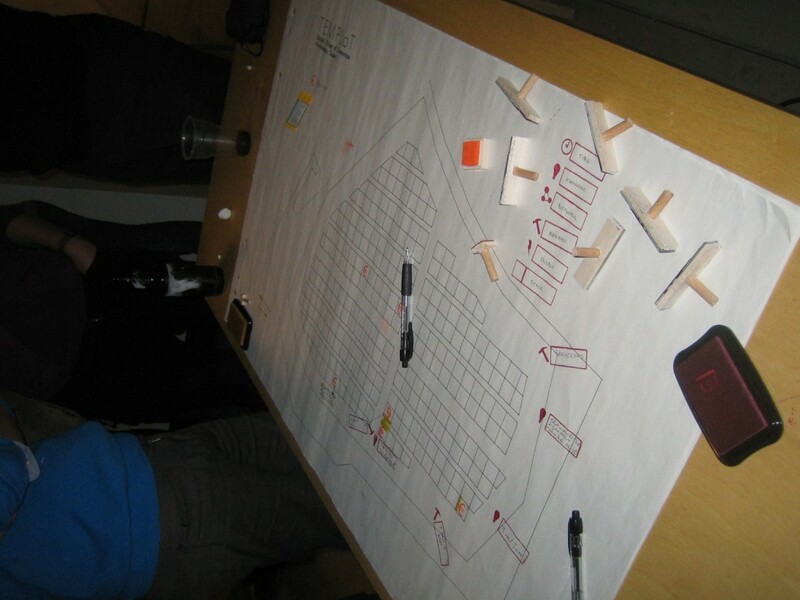 With some clean and simple mock-ups the team explained the concepts of private plots, shared flex space with neighboring plots and the public contribution zone for which the community as a whole would be responsible. After having finished the presentation, it was time for the stakeholders to respond. First of all, Temp.architecture was impressed with the presented ideas. The clearly loved the back-to-basics, bottom-up approach of this idea, though they did have some concerns about the complexity of the flex space concept and what would happen after the one year period had passed. Though to be honest, these are all details that could be further investigated at a later time. For now, Temp.architecture has expressed an interest in continued cooperation with the team and recognizes that this case is not unique to Amsterdam. Similar issues exist across Europe, so if further developed, this idea could have some serious potential. Second up was team 2 of the Haagse Havens case. Again, the team started with a quick overview of the case. The industrial nature of the area, the locals businesses and the difficulties with previous attempts at revitalizing the area. The team started with the initial questions of how to identify and map the area’s cultural and economic values and how to use this information to improve the public spaces in the neighborhoods. After the initial visit to the area, the team soon understood that recognizing the area’s strengths wasn’t the issue. The local inhabitants and shop owners were all pretty clear on that. What seemed to be a more pressing problem was the communications breakdown between the citizens and the municipal offices. There had been plenty of attempts to improve the area, but the net results were always negligible. This lack of success has disillusioned the local population. So, in order to restore some of that lost trust, the team proposes a two-step plan. Step one would be to have a meeting between three representatives from the area with two city officials, assisted by one mediator. The goal of this meeting would to create documentary about the area filled with interviews with locals and portraits of local businesses. This should help to create some energy and momentum for step two. This follow-up step has both on- and offline components. The online component would take shape as a community website to help track issues and concerns and to facilitate more cohesive long-term initiatives. In order for the area’s inhabitants to get involved with such a platform, a simple offline idea has been developed: the lunch bus. This mobile diner could help bring people together, make them share stories and concerns which in turn could be entered into the community portal. The team is convinced that rebuilding an atmosphere of trust through simple, low-tech bottom-up involvement is the way forward. After the presentation, it was once again time for the stakeholders to respond. Stroom Den Haag very much liked the focus on bringing together the online and offline components of the proposed ideas. They particularly liked the lunch bus because there are currently only a few places available to eat in the area. Stroom Den Haag also agrees that rebuilding trust between the local inhabitants and the municipality is key and is eager to continue discussing the possibilities with the team.